I have this vintage, made in Denmark, 10″ Classic Vifa woofer in storage for almost 20 years. In all these years, I never got the chance to listen to it. Now that I’m all setup for testing 10″ woofers, I thought, why not, let’s see how well this 10″ fares in a 2-way. Mic at 36ins, Woofer axis. Impulse Window=5ms. No Smoothing. Nearfield below 600Hz. My frequency sweep (Fig 2) of the M25WO49-08 is remarkably similar to Vifa’s (Fig 1). A dip is recorded at 500Hz, exactly what is shown in Vifa’s response. I would normally avoid this dip and cross the woofer at least one octave lower but for this 2-way project, I’ll ignore it and cross it higher. The Blue plot is with my external crossover set at 1.5kHz (24dB/oct – Linkwitz Riley). The roll-off is beautiful. No sharp peaks anywhere. I loaded the M25WO49-08 onto a ported box of 55 liters tuned to 35Hz (Fig 3). This is out of convenience because my test box is available. The bass should sound fine with a System Q of 0.64. If I want to go deeper in future, I can always load the M25WO49-08 onto a larger 80 liters enclosure. The Red plot (Fig 4) is of the Pyle PDS442+Dayton H07E at 1.5kHz (24dB/oct, Linkwitz Riley). The two drivers cross acoustically at about 1.4kHz which is close to 1.5kHz on my external active crossover. Fig 5 – Summed Response with Pyle PDS442+H07E wired in Reversed Phase. Mic at 36ins, H07E axis. Impulse Window=5ms. No Smoothing. Nearfield below 600Hz. Fig 5 is the Summed Response of the Vifa M25WO49-08 with the Pyle PDS442/H07E combo. It is virtually flat from 600Hz to 7.5kHz. The Pyle PDS442 is wired in reversed phase for proper summing. Fig 6 – Summed Response with Pyle PDS442+H07E wired in Normal Phase. Fig 6 is the Summed Response with the PDS442 wired in Normal Phase. A null is visible at about 1.4kHz, which is where the two drivers crossed acoustically (Fig 4). The null is not as deep as I would like but for the time being, it’s good enough. Fig 7 – Distortion Sweep with Mic at 24 ins. The 2nd (Red) and 3rd (Violet) harmonic distortion of the Vifa M25WO49-08 with the Pyle PDS442/H07E average about -55dB below the fundamental at 1kHz upwards. Disregard the measurements below 1kHz as they are inaccurate. The M25WO49-08 seems to be well damped as there’s minimal excess energy below 2kHz light blue slices). The plot from 2kHz onwards is from the Pyle PDS442 coupled to the Dayton H07E horn. An increase in excess energy is recorded from 7kHz ~ 15kHz. These are from the roll-off of the Pyle PDS442 and H07E horn. During auditioning, I couldn’t detect any issues as they are in the ultra-high frequency range. The Spectrogram in Fig 9 shows no smearing at 7kHz upwards. The Violet patch (-30dB) is only at 1msec which is impossible to hear. 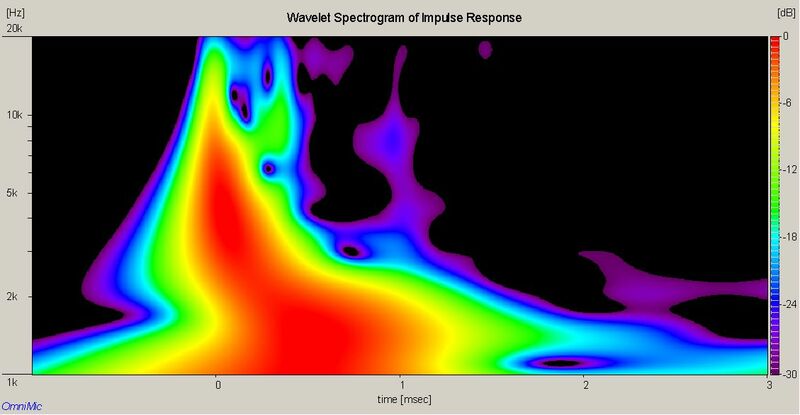 As the frequency moves towards 1kHz, the intensity (Red) increases progressively. This indicates a wider dispersion at the lower frequencies. The Vifa M25WO49-08 is in a separate class from the rest. On a scale of 1-10, I would rate this Vifa M25WO49-08 at 7-1/2. My Peerless NE265W-04 is right at the top, a 10. The Dayton DA270-8, on the other hand, is at 5-1/2. The M25WO49-08 shares similar traits as the NE265W-04. The clarity and detail in the bass are astonishing. Add to that the fast attack and damping, you have a bass performance that cheaper woofers simply lack. As for the vocals, I couldn’t detect the dip at 500Hz. Male voices sounded perfectly natural, unlike the Dayton PA200-8 with the 700Hz hump. Female voices are reproduced equally well. No shrillness or harshness. I am really impressed with this 10″ Vifa M25WO49-08. It’s been a while since I last enjoyed my music so much. It is a shame that this woofer is discontinued. Perhaps Tymphany would reconsider bringing it back. The M25WO49-08 is indeed a Classic.